I'd be down. But I'd probably never listen to the song again. I kinda hate talk like this, but Sorrow is a better opener for the album than Terrible Love. No interested in this at all. go to this thing and tell them that. They won't play this song ever again after this thing. So The National are actually performing Sorrow for six hours???? They arn't having just a lil boombox play it?? Do they get to go to the bathroom, or do they have to Jack Bauer it??? I'm familiar with big experimental/avant garde classical things that go along these lines length wise. Morton Feldman... John Cage... some Steve Reich, etc. Based on their side projects, I could see The National being down with this. As long as they don't have to play the actual song verbatim, it could be really interesting. Remember that bit at the end of Wilco's YHF where there's chords from Reservations plodding along atmospherically in half time? If they did some meditative open form things on the chords instrumentally for sections, it could be very cool (for the completely committed). 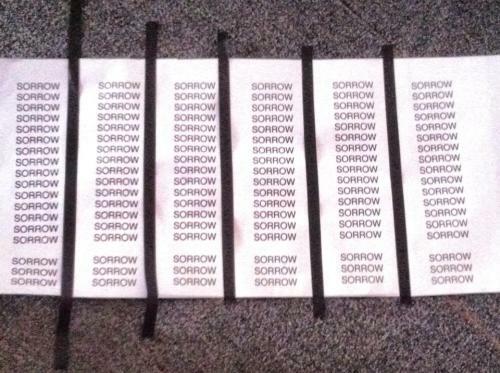 Obviously 105 times or whatever wasn't enough to put them off Sorrow, because it's in there. "Actually as the hours went on I think we all realized that this experience was something special for us -- there was a weird hypnotic resonance and spirituality to repeating the song over and over. We almost didn't want to stop and we learned something about our capacity for endurance and the song opened up in surprising ways... By the end it didn't feel like we were playing it anymore. We know the idea seemed pretentious in some way, but [artist] Ragnar [Kjartansson] has this mix of humor and sadness that feels quite similar to what our songs are about... We're very glad to have done it." I figured that'd be the case for them. I get it. I still wonder if they did any extended breaks or re-arrangements during the course of this. I think we are actually planning to release a 6 hour vinyl version of that performance for charity. Seriously. Hope it happens. So this is getting released as a vinyl box set. I think I've finally found the limit to how much of a completist I am when it comes to this band. If this had been 10 days ago I would have thought it was an April Fools joke. I love the National and have everything they've released on vinyl so far but I'll be passing on this. They could have put out so many better live shows, unreleased stuff, their movie soundtrack songs heck even their Bob's Burgers songs and I'd have bought them as would many others I'm sure. But 6 hours of them playing one song I'm not even a huge fan of in it's album form? No thanks guys. I wish them well with raising money for charity but this release is nonsense. People are gonna buy this and it will sit on their shelf. Can't imagine getting home after a hard days work, getting a cold beer and flicking through LPs and deciding "hmmm think I'll listen to disc 7 of Sorrow tonight! ".